Where was the Crystal Palace? Who was the Sick Man of Europe? And how did cow fat start a revolution? 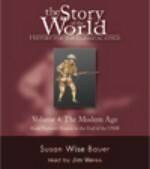 This is the last in Susan Wise Bauer’s Story of the World history series brings to life the stories and records of the peoples of the modern age. Now more than ever, other countries and customs affect our everyday lives-and our children need to learn about the people who live all around the globe. Susan Wise Bauer has provided a captivating guide to the history of the ancient world. Written in an engaging, straightforward manner, The Story of the World weaves world history into a storybook format. This volume covers the major historical events of the years 1850 to the late 1990s, from the reign of England’s Queen Victoria to the collapse of the Berlin Wall. and color and construct a timeline of the Modern Age. This comprehensive activity book and curriculum guide contains all you need to make history come alive for your child. Along with the accompanying book The Story of the World, Volume 4: The Modern Age, this Activity Book provides a complete history program. If you would like to save yourself the trouble, you can purchase the separate Student Pages 4. 42 tests: one for each chapter of The Story of the World. Perfect for evaluating comprehension and retention. The narrative format of The Story of the World helps children remember the famous people, places, and events in history. These tests offer you an easy way to make sure that your child is absorbing the important events from world history. A combination of multiple choice, matching, fill-in-the-blank, and short writing samples allow you to evaluate your childs retention and comprehension of key events in The Story of the World.